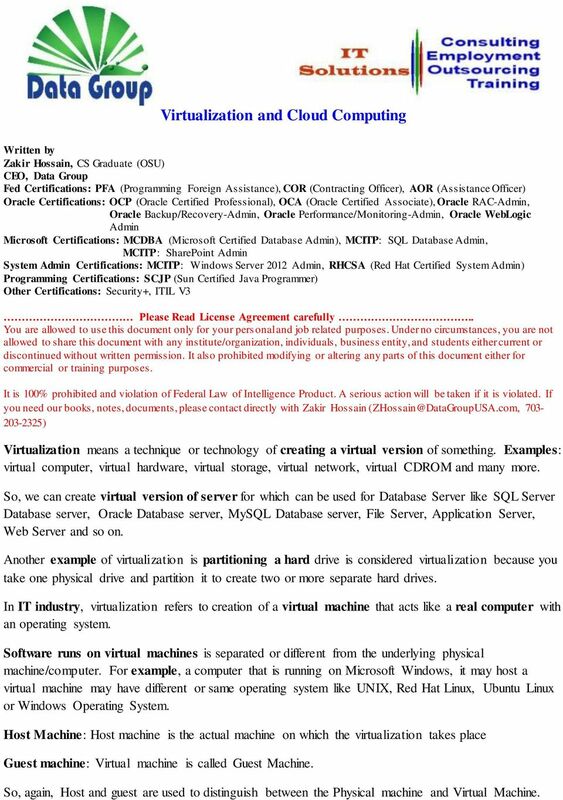 Download "Virtualization and Cloud Computing"
1 Written by Zakir Hossain, CS Graduate (OSU) CEO, Data Group Fed Certifications: PFA (Programming Foreign Assistance), COR (Contracting Officer), AOR (Assistance Officer) Oracle Certifications: OCP (Oracle Certified Professional), OCA (Oracle Certified Associate), Oracle RAC-Admin, Oracle Backup/Recovery-Admin, Oracle Performance/Monitoring-Admin, Oracle WebLogic Admin Microsoft Certifications: MCDBA (Microsoft Certified Database Admin), MCITP: SQL Database Admin, MCITP: SharePoint Admin System Admin Certifications: MCITP: Windows Server 2012 Admin, RHCSA (Red Hat Certified System Admin) Programming Certifications: SCJP (Sun Certified Java Programmer) Other Certifications: Security+, ITIL V3 Please Read License Agreement carefully.. You are allowed to use this document only for your pers onal and job related purposes. Under no circumstances, you are not allowed to share this document with any institute/organization, individuals, business entity, and students either current or discontinued without written permission. It also prohibited modifying or altering any parts of this document either for commercial or training purposes. It is 100% prohibited and violation of Federal Law of Intelligence Product. A serious action will be taken if it is violated. 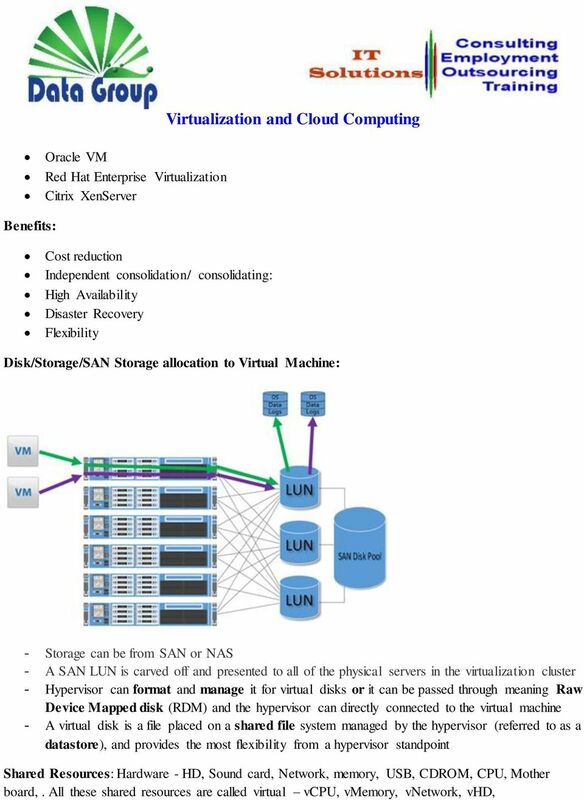 If you need our books, notes, documents, please contact directly with Zakir Hossain ) Virtualization means a technique or technology of creating a virtual version of something. Examples: virtual computer, virtual hardware, virtual storage, virtual network, virtual CDROM and many more. So, we can create virtual version of server for which can be used for Database Server like SQL Server Database server, Oracle Database server, MySQL Database server, File Server, Application Server, Web Server and so on. Another example of virtualization is partitioning a hard drive is considered virtualization because you take one physical drive and partition it to create two or more separate hard drives. In IT industry, virtualization refers to creation of a virtual machine that acts like a real computer with an operating system. 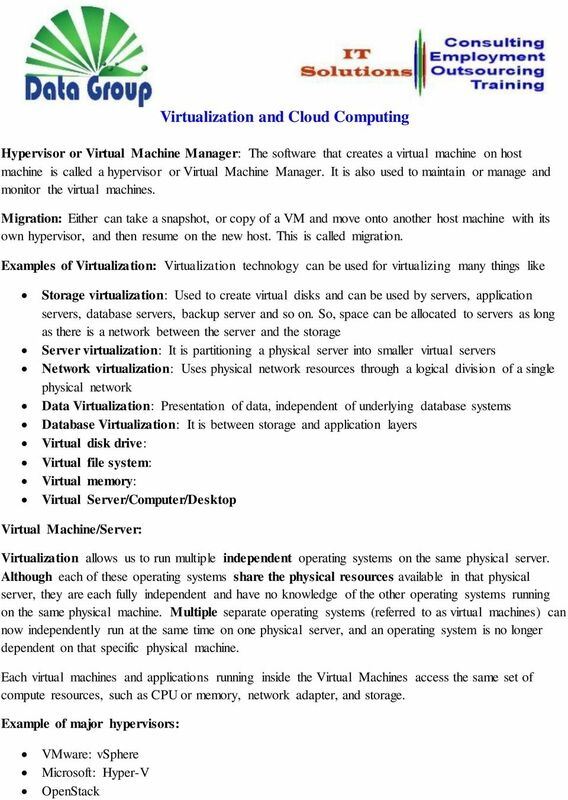 Software runs on virtual machines is separated or different from the underlying physical machine/computer. For example, a computer that is running on Microsoft Windows, it may host a virtual machine may have different or same operating system like UNIX, Red Hat Linux, Ubuntu Linux or Windows Operating System. Host Machine: Host machine is the actual machine on which the virtualization takes place Guest machine: Virtual machine is called Guest Machine. So, again, Host and guest are used to distinguish between the Physical machine and Virtual Machine. 5 1. Private, 2. Public or 3. Hybrid. Private cloud services are delivered from a business' data center to internal users. This model offers variety and convenience, while preserving management, control and security. Internal customers may or may not be billed for services through IT chargeback. Public cloud model: In public cloud model, cloud service provider delivers the cloud service over the Internet. Public cloud services are sold on-demand, typically by the minute or the hour. Customers only pay for the CPU cycles, storage or bandwidth they consume. Leading public cloud providers are Amazon Web Services (AWS), Microsoft Azure, IBM/SoftLayer, Verizon Terramark, and Google Compute Engine. Hybrid cloud Model: Hybrid cloud is a combination of public cloud services and on-premises private cloud with orchestration and automation between the two. Companies can run mission-critical or sensitive applications on the private cloud and at the same time can use public cloud for workloads that must scale on-demand. 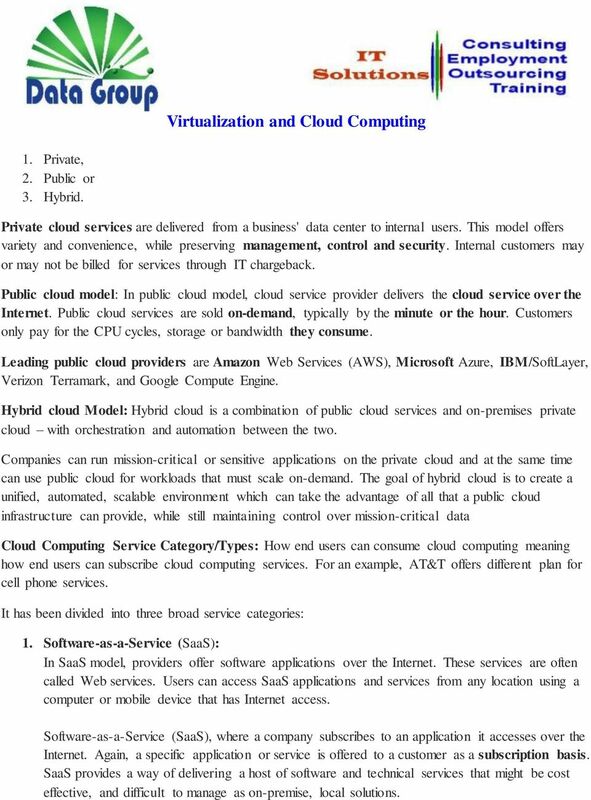 The goal of hybrid cloud is to create a unified, automated, scalable environment which can take the advantage of all that a public cloud infrastructure can provide, while still maintaining control over mission-critical data Cloud Computing Service Category/Types: How end users can consume cloud computing meaning how end users can subscribe cloud computing services. For an example, AT&T offers different plan for cell phone services. It has been divided into three broad service categories: 1. 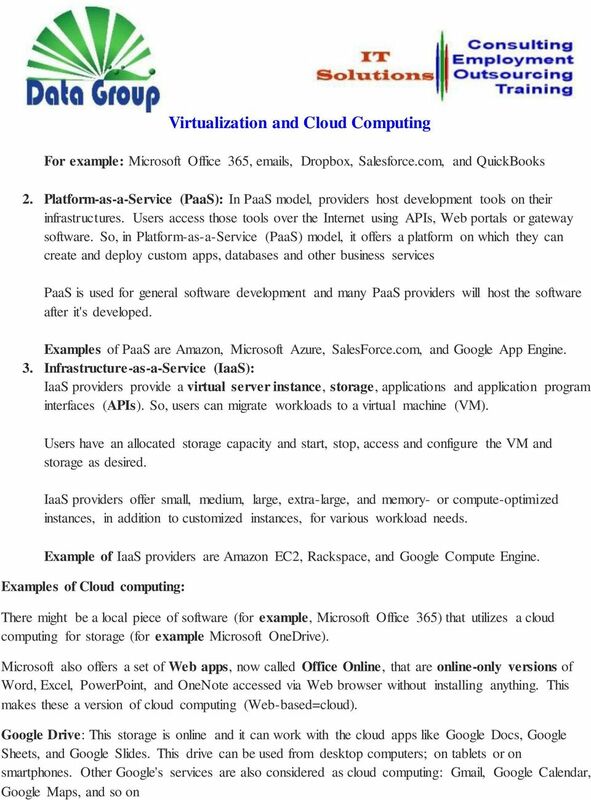 Software-as-a-Service (SaaS): In SaaS model, providers offer software applications over the Internet. These services are often called Web services. Users can access SaaS applications and services from any location using a computer or mobile device that has Internet access. Software-as-a-Service (SaaS), where a company subscribes to an application it accesses over the Internet. Again, a specific application or service is offered to a customer as a subscription basis. SaaS provides a way of delivering a host of software and technical services that might be cost effective, and difficult to manage as on-premise, local solutions. Simply type the id# in the search mechanism of ACS Skills Online to access the learning assets outlined below. Keywords Cloud computing, Cloud platforms, Eucalyptus, Amazon, OpenStack. Today: Data Centers & Cloud Computing" Data Centers"
Beginning Azure. Ready for the Cloud! 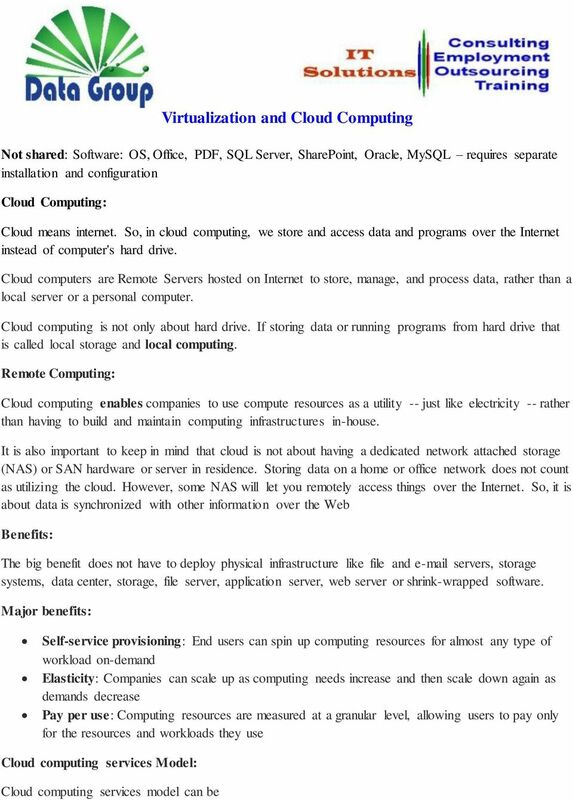 Storing & Synchronizing Data In The Cloud Val D. Steed, CPA, MA, CITP CEO K2 Enterprises Copyright 2012, K2E, LLC. Reproduction or reuse for purposes other than a K2 Enterprises training event is prohibited.